Chile is a country on the rise. This phrase may be taken both literally and figuratively, as the Andes mountains to its east push the land up to some of the highest elevations of South America, and as its political life, economy, and culture are improving now in ways that may have seemed impossible ten years ago. Indeed, Chile in the 21st Century is one of the single most exciting, beautiful, and worthwhile destinations in the Americas, and spending time there as either a tourist or as a student will reward you much more than you likely ever thought possible. There is no way to begin a discussion on studying abroad in Chile without first addressing the issue of the country's capital, Santiago. It "was founded by Pedro de Valdivia on February 12, 1541 with the name Santiago de Nueva Extremadura. The founding ceremony was held on Huelén Hill (later renamed Cerro Santa Lucia). Valdivia chose the location of Santiago because of its moderate climate and the ease with which it could be defended -- the Mapocho River split the area in two, and rejoined further downstream, forming an island." Even today, the natural beauty of Santiago is apparent to residents and visitors alike, despite the fact that it has grown to become home to nearly 6 million people, "equivalent to nearly 40% of the total population of the country, making it one of the largest cities in Latin America." Santiago is a bustling city with two symphonies, a thriving popular music scene, world-class museums, a famously breathtaking view of the snow-capped Andes Mountains, and several dozen universities. Of course, there is much more to Chile than its capital, and the fact that Chile is home to such a world-class urban center as well as gorgeous natural environments makes it a perfect place in which to study for both city-lovers as well as those more enamored of the natural world. For the latter, there is no better place than Patagonia. "The Patagonia region, located in the southern end of South America, embraces partially the territory of Argentina and Chile. 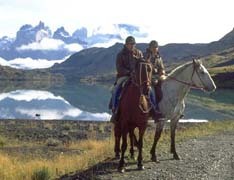 Since it was discovered, the single mention of its name wakes up the fascination of the distant, virgin, and unknown...In Chile the Patagonia travels from the VIII Region and down below to Tierra del Fuego island embracing areas of great natural attractiveness and unsuspected beauty, provided with volcanoes, lakes and forests." So for those with a love of adventure and a yearning to explore some of the most pristine, exotic, and exciting locales in the world, Patagonia is the perfect place to visit. Chile is also known for its wine industry, which is one of the most vigorous in the Americas. In fact, the land and climate in certain parts of Chile are so good for growing wine grapes that some of the most influential French and American wine companies have invested heavily in the Chilean industry. The result of this infusion of both money and knowledge makes Chile an exciting, enriching, educational place to study. As has been mentioned earlier, Chile wasn't always the peaceful and prosperous nation that it is today. Indeed, it was the home of one of the most despised dictatorships of the second half of the 20th Century -- that of General Augusto Pinochet. Today, however, Chile is home to a democratically elected government, a strong economy, and a thriving cultural life. Combine these things with the fact that Santiago is literally full of universities and the only possible conclusion to reach is that Chile is a great place to study abroad. Spend days hiking through Patagonian steppe and rare temperate grasslands and exploring the beech forests and high peaks of the future Patagonia National Park. Assist our partner organization, Conservacion Patagonica, with wildlife and vegetation studies. Live with Ecuadorian and Chilean host families. Travel is built into your curriculum. Your course work will be entirely in Spanish, so you can truly immerse yourself in the Spanish language and Chilean culture. Students will discover what “global” means in a Latin American and Chilean context in two courses, one on Globalization and Social justice and one on the Spanish language. Students will have many opportunities to engage with the vibrant culture. Universidad del Desarrollo (UDD) has campuses in both Santiago, the capital city of Chile, and Concepción, the most important city in the south of Chile. Each campus has a unique character and an important presence in the community.